There are lots of reasons to ride a bike: It is fun, it is good exercise, it is good for the environment, and it uses no gas. You can ride by yourself or with friends or family. You can ride if you are 6 or 60. You can ride around the block or across the country. However, whenever you ride, there are some things you should do to make sure that you stay safe. You should wear a helmet every time you ride your bike, whether you are going two blocks or 10 miles. 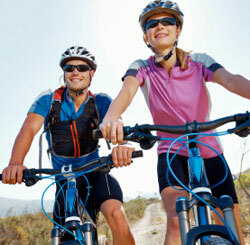 There are lots of styles of helmets, so you should have no trouble finding one that is comfortable for you. Once you choose a helmet, be sure to wear it correctly. Don’t wear a hat under the helmet, which should fit snugly. Position the helmet squarely on your head; don’t tip it back. Make sure that the chin strap is fastened. And check the helmet periodically to make sure it still fits and it has not cracked or broken. Unfortunately, many adults ride without a helmet, even if they insist that their children or grandchildren wear one. Obviously, this sets a bad example for children and makes them much more likely to ditch the helmet once they are out of sight of adults. If you have children or grandchildren, outfit them with a helmet from the time they ride their three-wheeler on the sidewalk. There are lots of fun helmets featuring cartoon characters or other kid-friendly designs. If you take a strict but matter-of-fact approach to wearing a helmet from the start, children are less likely to rebel against a helmet later on. Beginning bike riders of any age might benefit from wearing additional safety gear such as knee pads or wrist protectors. If you might ride at dusk or after dark, be sure to get reflectors and a bike light. Smaller children and beginning bikers should stick to bike paths or sidewalks until they are proficient enough to ride on the street. And even then, both adults and children should learn the rules of the road. It is not only the right thing to do, it’s the smart thing – in any collision between a bike and a vehicle, the biker is at a distinct disadvantage. Always ride on the right side of the road, in the same direction as car traffic. Obey all traffic lights and signs. Slow down and look both ways before crossing any intersection. Walk the bike across busy intersections. Ride single-file in the street. Don’t get too close to parked cars, and be on the lookout for opening car doors. Always ride under control, with both hands on the handlebars. Use hand signals to signal when you are making a turn or coming to a stop. Watch out for hazards such as ice, potholes, etc. Make sure that the bike fits the rider. When you straddle the bike with both feet on the ground, there should be 1 to 3 inches of clearance between you and the bar. Similarly, the handlebars should allow you to reach them comfortably and control the bike. Dress appropriately. Wear shoes instead of sandals to provide protection for your feet. Make sure pant legs cannot get tangled in your chain. And avoid wearing headphones, which can block out traffic or other important sounds. Finally, make sure to keep your bike in good repair. Oil the chain, and check the tire pressure. Test the brakes. In fact, it is a good idea to get your bike professionally tuned up before the riding season begins.